Hour session in 7m weather hanging on for dear life, VERY VERY choppy, different conditions for me with waves coming from all over the place and very variable. Sun came out just as I stopped and got this snap! Tidal spot. Loads of space. Safe for beginners I'd say given the space and lack of other users. But clearly choppy so maybe difficult. Thanks to the Kinmel Bay Kitesurf school, based right at this spot - for the 5 quid loan of a wettie and the launch & land! Tides make a huge difference at Kuxville. 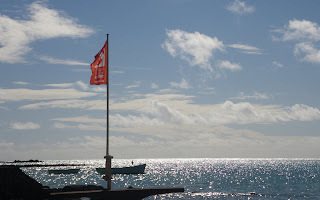 Went out yesterday - final day in Mauritius - in some strong winds. Was flat when I left, then had a minimare, then when I got back out again it was full choppy, then an our later it was perfect flatwater upwind of the little island. PERFECT for perfecting those bloody front loops! Managed to land quite a few in the end. It's obvious and funny with all these things, once you've grapsed it you've no idea why it was so hard before! Anyway the minimare: Just as drift launching, I lost my board in the current running downwind. This i not a problem normally, but here it was close to the shore and thus in the lee of the wind. So every time I bodydragged close, the kite started dropping. So I was following it along downwind, downstream, trying to get close enough to the bugger. In the end I dropped my kite too close to some rocks, and it was mission aborted. No harm done. Except a few more coral cuts on my feet and a nice bruise on my knee. Well worth paying that little price for the two ours I had on the water before heading to the airport for what was 24hrs of journeying - taxi/plane/transfer Paris/plane/aborted Heathrow Express/taxi/fast train to Chester/pick-up. Last half of that with just me & the toddler, and seven bags! Enjoy Brighton mummy! Had a look at the Advance Progression DVD yesterday, and today there was a spot of wind at last. So tried out the unhooked thing - essentially just steering off downwind, unhooking, hanging-on, then steering downwind again to hook back in. Why I've not been doing this before? Well cos I never watch the DVDs - why AM I trying to reinvent the wheel. I got the best two ours of the day out there, which was still marginal, I came in when the tide got very low and a trapped fin on the coral ended up bloody. Just two others out today. Forecast good for tomorrow. I have the strange sensation today of being glad the wind is not there so it means I can sit on our verandah and enjoy the afternoon with my little girl, take her swimming and catch up on emails and start my John Steinbeck book – from the limited English language section at the Kuxville library. Played around for an hour or so crashing over & over, doing backloop transitions and forward loops. Going to the left – my usual preferred direction – I find it harder to land the front loops. 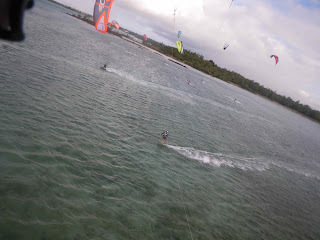 After all tat I made a big upwind run out to two kites on the reef to join them on some waves for a bit. Quite exhausted by the end. Sweet run home to a chaotic self-land at the little beach out of the wind. Nico Kux lent me his directional – I have one back in Sydney but have rarely used it. 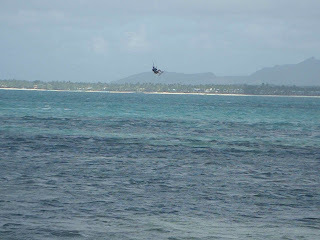 So I took it for a spin, pretty big and unwieldy compared to the F-One fish (5”2’) I tried in Le Morne. 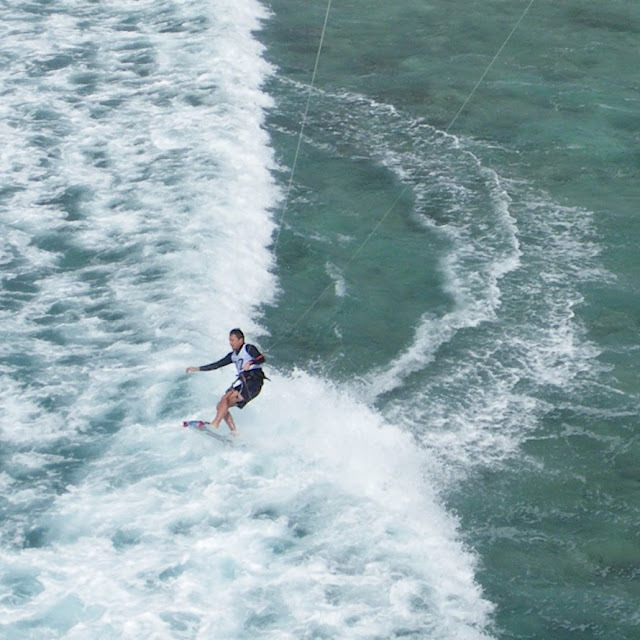 I played on the edges of the reef break where the crew were – Daniel, Cameron etc – then went to the Anse La Raie lagoon to mess about with gybing. Or try it for the first time. Manged quite easily to get either foot out. And to turn to toes side with rear foot out. The hard part is the wriggle-round which I didn't manage to pull off. Was perfectly powered at the beginning of my session, but past 2:30pm wind picked-up too nicely for my 11m and spent the rest of the sess over-powered. So played around in the lagoon with crappy tricks, mostly practicing powering up pops to give me pure veritical lift – I’m thinking this will help me manage the psychological pregoression from back loops to front loops? Half way thru went in for a strugglesome land at the public beach where most of the kiters kit-up to change the kite settings, clutching at straws to get a bit less power. Slightly tricky landing, quick swap of the attachment points, and back-up. In the meantime, someboy fed is lines thu mine so the launch was tortured wile he sorted is sh1t out. Then back on the water for more of the same. In the end decided to finish my session here, rather pathetically I was nervous of hammering it round the corner overpowered into te back of Kuxville. Landing at Anse La Raie was chaotic again with the wind gusting, so ended up dropping the kite and letting it release onto the flagging line, then some guy grabbed it. Nice little walk home from there. Went for a solo mission at Palmer public beach. Could've kited directly in front of this hotel on that beautiful sand bar out front but sought the company of others for launching & landing a short clockwise stroll from the hotel. Started off in 11m, got some tips on front loops form a bystander but had no success. Wind picked-up so tried 7m but was all over the place with it. Bit unsatisfactory all-up but good to get out nevertheless. Nice walk through the lane/vegetable patches back tot he hotel. 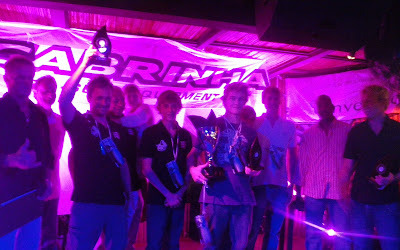 Did I mention the awards ceremony last night - for Kiteival. 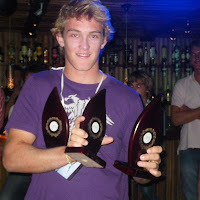 Daniel Kux swept the board getting Freestyle, Course and Wave Expression. And then to mine - and literally everyone else's surprise - I took the speed kiting. I managed to get 65kmph speed with most of the others getting around 58-59-60kmp. Crazy hey! I’m sitting looking at the ocean at the open air breakfast restaurant, two eggs just perfectly cooked in front of me and two pancakes the same – they even had Nutella. And my coffee came with hot milk. I woke up this morning with abs. Honestly – I caught a glimpse in the mirror when I got out the shower. First time ever I think. 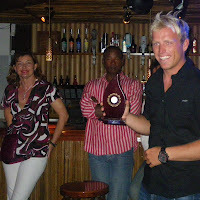 And a hangover – I left them on the dance floor at Banana Bar at 3am - my driver was awaiting outside!! You need to spend a lot of money get the high I was on yesterday – someone last night described it as a typical runner’s high. 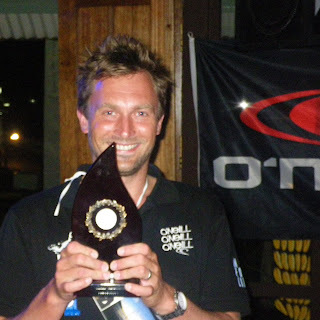 Somethings that fuzzily are coming back to me - Nico saying something about me taking a year off his life when I went down in the reef - thx Cam for getting that kite back in the air so neatly rather than leaving me int he channel with the big animals. What an amazing event – well done Nico and the team! The course event this afternoon was something else – already knackered from the morning and four days of endurance kiting, we finished with two courses – in the Anse La Raie lagoon – ie kite out to the buoy, then upwind to another buoy, then back in through some rocky islands to the shore, and round to the first buoy again and back. Sketchy wind made the start line hilarious – with kites dropping like bombs. Fortunately was shallow and sand so people kept it together with no crossed lines. Then – off. The (horn)), I managed to beh at the back of the pack before we’d even left the shore line practically, and stayed there til the end of race one. Totally high when we finished. Very like an very expensive high. Like the feeling I had when I completed the marathon. Music blaring. Almost weepy from exhaustion and delight. Kiteival rocks. Very big day – felt like an endurance thing. Nico got rare permisson to launch from the sailing club at Pointe d’Esny. Wind was howling til we set going (11m), then a huge upwinder to get out of the bay – Brad (South African/long scrabbly hair/great kiter) and I got stuck in a hole, with the current around the island dragging us up the river mouth downwind. A gargantuan effort and the longest single direction run of my life eventually got us out of there – my leg was shaking as we eventually got to the reef break! Then messing about in the flat water while some of the others who'd made it out as far as the sand bar played around there. 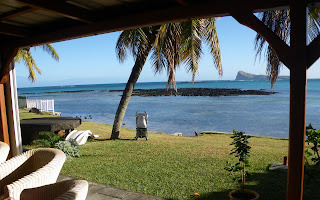 Then downwind to our island golf course for lunch – totally exhausted and freezing cold – one of our packing measure for this big trip was to skimp on the wetsuit. Everyone else sung in their shorties, I was in a 1mm radiator top! Thanks to Nana for the hoodie! Anyway eventually got our stamina reset to go intot he sopeed racing comp. Of course the speed course was a massive upwinder from the island. Then finished the day with a punishing downwinder to Trou d’Eau Douce (near Hotel Tropical) then Tim Tams Snickers water and beers in quick succession. Sunday seems to be respected on this island which suits me fine. 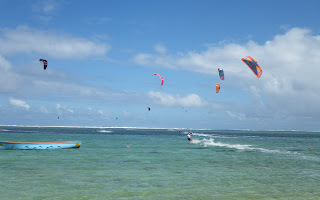 God I need it – obviously some of the kiters – Thisot, Cameron etc have gone back to Le Morne – Nico didn’t kite yesterday so is keen to get out there, and Cameron needs some waves footage – I’m familiying today and giving my body a rest. Smoked loads ciggies last night which was dumb as really feeling it today. 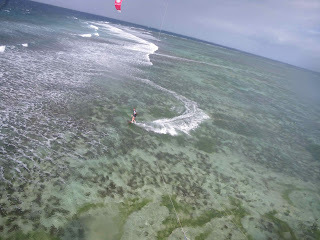 Kited out from Tamassa hotel on a approx 10km downwinder to the lagoon at Le Morne. Cameron Dietrich, Cabrinha team-rider gives the thing some kudos. Safety boat followed us. IDEA: –Run these in Sydney/NSW – charge people a fee for the transport and really for the boat support? Need to get a boat guy involved. That Green Island to Yorkey's Knob downwinder is still unfinished business. rich should be able to get a boatman to track us. The big rock at Baie du Cap was where they had the cameras/video based to picture us – extremely choppy around there though. Some waves to play in too just a bit upwind of that spot. Then got to the upwind part of the Le Morne lagoon – just divine – beautiful turquoise water with sand below, perfect for my playing with backloop transitions. Revelation: POWER THE BLOODY KITE UP when doing tricks!! Makes a huge difference!! Obvious, I suppose. 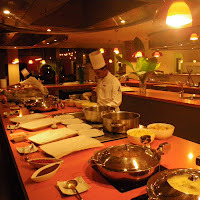 Then lunch at the café at Les Pavilions – got on the back of a Ute to get there which added to the excitement – wind blowing through the hair along a bumpy coconut tree lined road makes you feel like your on a tropical holiday! Nico orgniasd for a watchtower to be rigged up on the edge of the reef –Cameron, Nico , Brad and AN Other boated out to it – and raised a red flag – after an hour the flag was dropped. In the meantime the aim was to strut our stuff in the wavers, or have fun, or generally fk about in my case. Eight of the group had a go – clearly some of the guys were really good, I was probably the weakest – but as I told myself – not as weak as the half of the group who didn’t try at all! Made it to dinner early and to the bar with Cam – who was full of lots of tips of places to go that might fit into our vague schedule: Summary: Portugal & Sardinia for all round experience – people/kiting/food – seems like he'd had a poor experience in France, and loved Cornwall and its drinking – raves about Namoua(sp?) 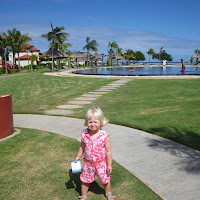 in Fiji and the other one beginning with T – private resort islands, great to kite – and of course Cabarete. Tarifa uncomfortably crowded and regulated. Has been on Odyssey (I’ve been contemplating that for a few years , and was emailing Gavin just a couple of months ago about joining up for 2010 – I think I need to get Jon to join me on it) – and totally rates it and Gavin. Knows Moe and Ben and knew of that New Cal trip I went on a few years back. Has links with some place in Peru/yoga resort/kiting which sounds great.